1. Start GNOME or KDE. 2. If you configure Gnokii/XGnokii to use the gnapplet driver, start gnapplet on the Symbian mobile phone now. Figure 1. The screenshot of XGnokii's main window in Linux (GNOME, Fedora Core 5). The battery bar ( in the above figure) shows the battery charge level of the mobile phone. The signal bar ( in the above figure) shows the radio signal strength. 4. 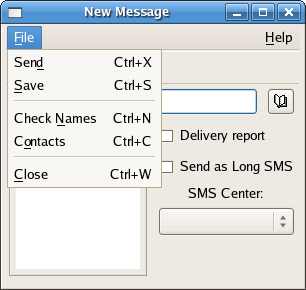 Click SMS ( in the above figure) in XGnokii's main window to open the Short Message Service window. Figure 2. 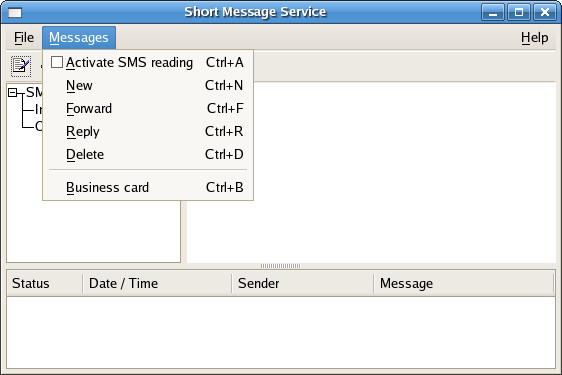 The screenshot of XGnokii's Short Message Service window in Linux (GNOME, Fedora Core 5). 5. 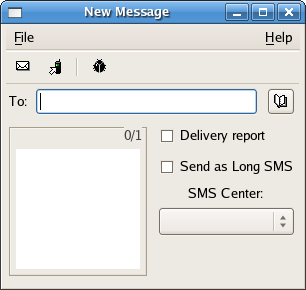 In the Short Message Service window, click the Messages menu. Then click the New menu item to open the New Message window. Figure 3. 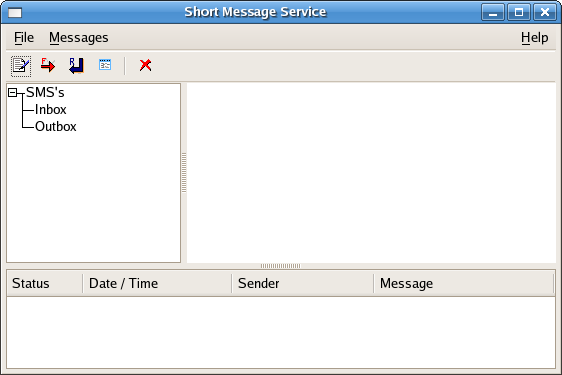 The screenshot of XGnokii's Short Message Service window in Linux (GNOME, Fedora Core 5) when the Messages menu is clicked. Figure 4. The screenshot of XGnokii's New Message window in Linux (GNOME, Fedora Core 5). 7. In the bottom-left text box, type the text message you want to send to the recipient mobile phone. 8. If you want to receive a delivery report that informs you whether the recipient successfully received your SMS text message, check the Delivery report check box. 9. To send your text message as a long SMS message (also known as concatenated SMS message), check the Send as Long SMS check box. An ordinary SMS text message can only contain at most 160 characters (or 70 characters if the 16-bit Unicode character encoding is used). To send a text message longer than 160 characters, you have to send it as a long SMS. Long SMS works like this: the PC breaks a text message into smaller parts. Each of these parts are then fitted in one SMS message and sent to the recipient mobile device. If the recipient mobile device supports long SMS, it will combine the SMS messages back to one text message. 10. Use the SMS Center selection box to change the SMS center if necessary. 11. Select Send on the File menu to send the SMS text message out. Figure 5. The screenshot of XGnokii's New Message window in Linux (GNOME, Fedora Core 5) when the File menu is clicked.